See him: Chester Arthur was sometimes called the “Dude President” because he was such a snappy dresser. 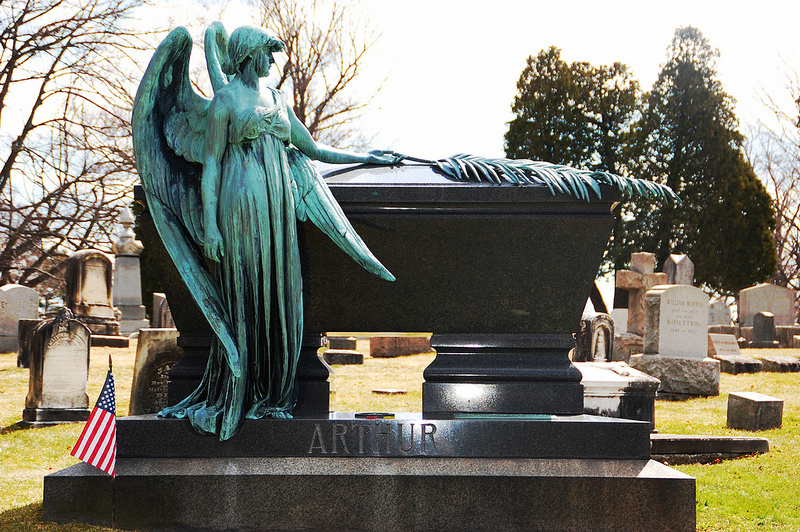 It’s fitting, then, that everything about his final resting place is exquisite, from the rolling hills of Albany Rural Cemetery, to the quiet atmosphere, to the ornate weeping angel statue who watches over his black marble sarcophagus. He’s on the corner of Linden Avenue and another street near the center of the (very large) cemetery. It’s not a bad idea to get a map before you go in, or keep an eye out for the tall flagpole as you drive – it’s just to the left of the tomb.